November | 2011 | YesBiscuit! Remember when ASPCA published documents calling no kill advocates “extremists” and specifically named the group in Austin as one of the threats to the status quo of the catch and kill shelter model, even going so far as to reportedly refer to them as “a terrorist organization” at the SAWA conference? Good times. But that was then. Well ok, it was just a few weeks ago. But this is now! 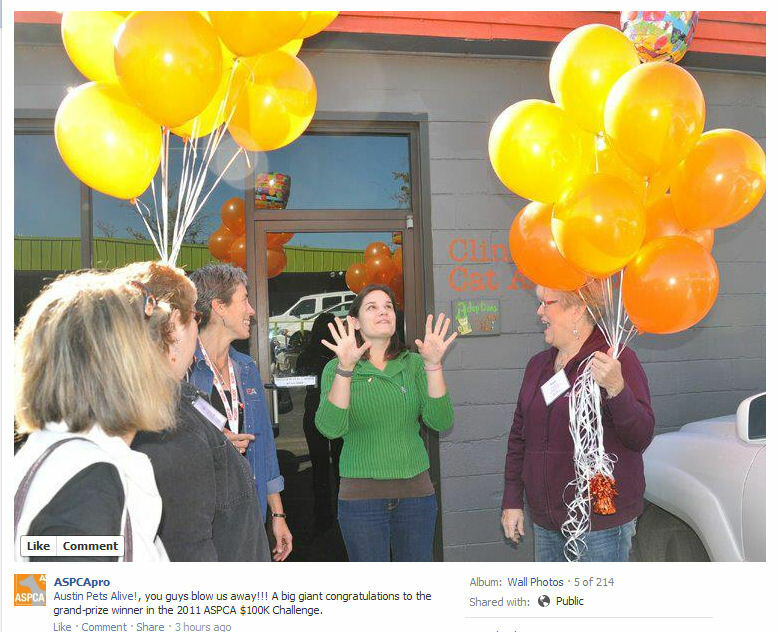 Facebook posting from the ASPCA on November 30, 2011. The ASPCA has officially supplied money – $100k – to a terrorist organization. If you have pet-related links, stories or questions to share, this is the place. I’ll start. Billy: Sure. What about ‘Lars’? This is Billy’s way of saying that he thinks Weeble is a stupid name. I don’t know how this will come across today, via typing, but last night it had me in stitches. I laughed til I had tears. Anyway, we ended up agreeing on a name: Surrey, after the county in England. Not for any special reason, but Billy had asked about where the breed was developed and that lead to this. Probably he was just trying to get my mind as far away from Weebles as possible. Thank you for alerting us to the gross misinformation recently posted on the Yes Biscuit web site regarding the Memphis Animal Facility. The kennel stats as well as the euthanasia records from Saturday, November 5 through Saturday, November 12 are attached for your review. The attached data reveals that there were no euthanasias conducted on November 6, 7, 9, & 11. The data further reveals that the euthanasias that were conducted on November 8 & 12 were deemed necessary by the Memphis Animal Facility’s Medical Director, a licensed veterinarian. Further, the euthanasias that were conducted on Saturday, November 5 included animals for which 1) their hold time had expired prior to or on 11/5/11, 2) owner surrenders, and 3) animals with medical conditions for which euthanasia would alleviate any further suffering. Please note that the the two pitbulls identified as #234328 & 234325 on the euthanasia report dated November 5 were two small pitbull puppies that were sadly unable to survive. The Yes Biscuit post indicating that the two animals “fell over dead in their cages” is a complete prevarication and unsubstantiated. 5) Upheld our commitment to the community by suspending euthanasias during the time frame from November 5-12. Further, you may also note that during this same time frame (i.e. November 5-12), the facility took in 124 additional animals (e.g. owner surrenders, strays picked up in the field, etc.). Hence, we entered the new facility with all of the animals from the old facility plus the additional 124 animals. Additionally, we resumed our field operation full-time on November 15, which consequently increased the number of animals brought into the new facility. On day 1, within the first hour of opening the new facility, we sadly witnessed more owner surrenders than adoptions. 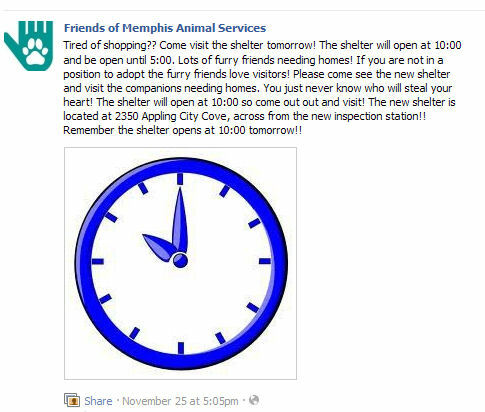 We hope that you will help us by encouraging more folks in the community to adopt animals from the Memphis Animal Facility on Appling Cove. We will celebrate our grand opening on Saturday, 12/3 at 11:00 AM. Again, we appreciate your partnership in identifying the communication error and for helping us to ensure that the general public has the correct information. I’d like to address several of these claims specifically. The attached data reveals that there were no euthanasias conducted on November 6, 7, 9, & 11. – This is correct. My post did not claim otherwise. To provide some context, November 6 and 7 fell on a Sunday and Monday. MAS does not normally kill pets on Sundays and Mondays as those are typically days off for the workers qualified to kill pets and the pound is closed. So not killing pets on November 6 and 7 qualifies as business as usual at MAS. The data further reveals that the euthanasias that were conducted on November 8 & 12 were deemed necessary by the Memphis Animal Facility’s Medical Director, a licensed veterinarian. – This is correct. My post did not claim otherwise. The pets killed on these two days are listed as being killed for medical reasons. Further, the euthanasias that were conducted on Saturday, November 5 included animals for which 1) their hold time had expired prior to or on 11/5/11, 2) owner surrenders, and 3) animals with medical conditions for which euthanasia would alleviate any further suffering. – #1 and #2 are not legitimate reasons to kill pets and directly contradict the city’s claims prior to the MAS closure that the only pet killing during this period would be for medical reasons. To provide context, MAS did not offer for adoption any of these pets whose hold time had expired or whose owners surrendered them. 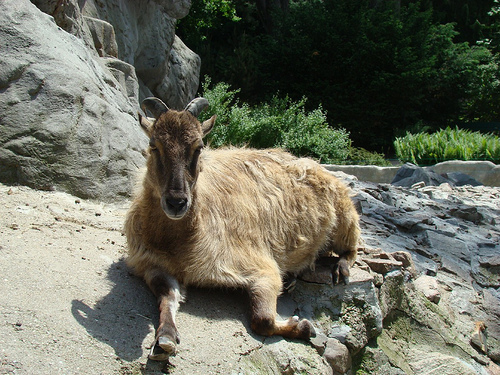 Further, the city refused to allow foster owners to care for them temporarily during the closure. They were needlessly killed for “space” or “behavior” and the MAS records indicate same. #3 references “animals” who were euthanized to alleviate suffering but in fact only 1 dog was killed for a medical reason on November 5 – not “animals” – and the MAS records indicate same. Please note that the the two pitbulls identified as #234328 & 234325 on the euthanasia report dated November 5 were two small pitbull puppies that were sadly unable to survive. The Yes Biscuit post indicating that the two animals “fell over dead in their cages” is a complete prevarication and unsubstantiated. – While Ms. Hall spins the deaths of these puppies as “sadly unable to survive”, I chose the terminology “fell over dead in their cages”. Call it “tap danced their way to the Rainbow Bridge” if you like but it doesn’t change the fact that these 2 pups died in their cages while in the care of MAS and the records indicate same. Ms. Hall provides no explanation for the 4 dogs who died according to MAS records on November 16 which seems like a curious omission on her part. Regarding Ms. Hall’s claims as to the tireless efforts of the city to work with rescuers and foster homes, I hope some rescuers will chime in to enlighten us on these exhaustive efforts. It was the “Friends” who advised people that the city would not allow the overwhelming majority of pets at the pound – those in the stray area – to be fostered. I would not describe the refusal to accept help from the public as a tireless effort to save pets’ lives. 5) Upheld our commitment to the community by suspending euthanasias during the time frame from November 5-12. – These two claims are clearly false in my interpretation and the MAS records indicate same. That was a main point of my post, to expose this attempt to deceive the public. Many pets at MAS who were alive on the morning of November 5 were not transferred to the new facility – they were killed for reasons such as “space”, “behavior” and “too young”. I stand by my original post. I did not provide any misinformation and the MAS records reflect same. If I make a mistake, I am always happy to correct the record. But based on Ms. Hall’s response, I don’t see where any correction is required. Further, I would offer that some of the claims made by Ms. Hall appear to be misleading at best. On day 1, within the first hour of opening the new facility, we sadly witnessed more owner surrenders than adoptions. We witnessed. To me, that is indicative of a failed administration. Shelters who work hard to save pets lives do not “witness” a lack of adoptions. If they see a downward trend in adoptions, they proactively rise to meet the challenge. It’s not easy being an open admission shelter and maintaining a live release rate of more than 90%. But in listening to people like Bonney Brown and Susanne Kogut speak, I don’t get the impression they do a lot of “witnessing”. Instead, they work their tails off getting the public involved in saving pets by actively seeking out foster homes for all their pets in need – not just the chosen few – and making it easy for people to adopt by letting the public in to see and touch all their pets and making adoption a positive experience. Memphis could do this too. They could start today. A Facebook posting from the "Friends" of MAS inviting people to come see the new shelter on Saturday, November 26, 2011. On Saturday I went to visit the new MAS facility around 3 pm with my 5 year old daughter. There was a friendly volunteer in the lobby and a puppy named Miss Wendy as the Pet of the Day in a playpen. The volunteer’s name badge was twisted so I didn’t catch her name. I told her I am interested in cats and she told us we may step into the cat room but to be careful not to get scratched because any cat that scratches will be euthanized. I didn’t dare pick up a kitty because I was afraid to jeopardize lives there. After looking at the cats we came out and wanted to see the adoptable dogs. There were about 3 or 4 people standing with another volunteer, Eleanor, who was explaining dogs to the visitors. I joined the group, casually mentioned that I am interested in seeing the dogs as well. I overheard Eleanor describe the guillotine type kennels and their hygiene and also mention that there are only about 20 stray dog kennels. Then she interrupted herself, looked at me and asked me whether I was here “to adopt or blog”? Pretty rude tone of voice. I was taken by surprise because I am not aware of ever having met this lady before and also – I don’t blog. I answered that I don’t blog (not a smart come back but I was just so taken by surprise) and she rudely informed me that I would have to ask MAS staff to take me to see the dogs. So I went to the MAS staff glass window, knocked and asked if someone could please let me in to see the dogs. There were 3 people sitting there, obviously working on computers, phones, papers. One lady told me I could go with a volunteer. I told her no, Eleanor said I would need to MAS staff to help me. They gave each other a very surprised look but one answered “Sure, we will send someone out”. I stepped back from the window and nobody came. Another woman with a little boy joined me. Eleanor’s group had grown by 1-2 people and they proceeded behind the locked door into the dog area. The other lady and I still stood in the lobby unattended. The friendly volunteer returned from walking a dog, I told her that I was still waiting for someone to take me to the dogs. Now Jeanne Chancellor walked by, gave me a very unfriendly look (???!) when the friendly volunteer told her to please let me and the other woman into the dog area. Which she did, being very curt, pointing us towards where to go in order to catch up with Eleanor’s group. I definitely was not there to adopt a dog because I rescue cats and cannot have a dog. But this was the Grand Opening and from my understanding visitors were actually not only welcome but invited. You here to adopt or blog? Way to roll out the welcome mat, MAS. Sounds like things have totally changed now that there are new walls to house the bullying tactics used to protect the status quo. Thank you Annie for sharing your experience. I hope you will not be discouraged in your kitty rescue efforts. 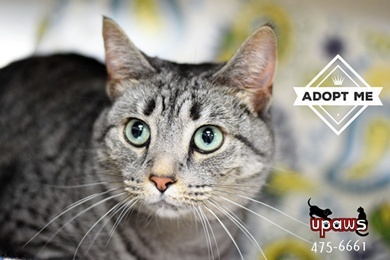 The cats in Memphis need you. 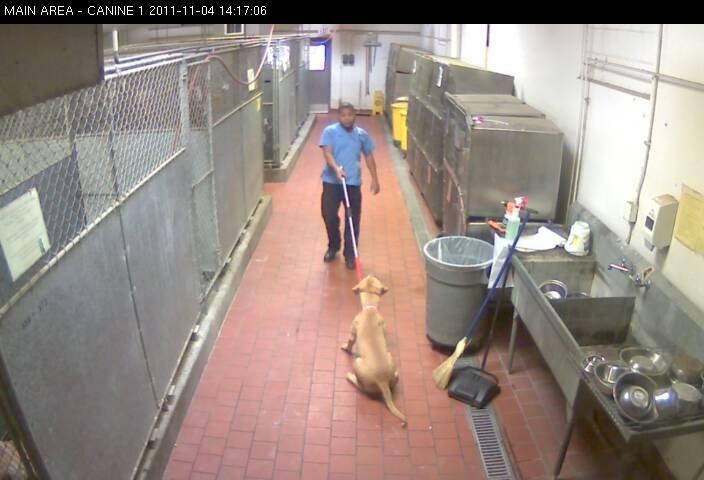 A dog in the stray area at MAS is dragged on a chokepole on November 4, 2011. Any animals left in the stray area and adoption areas will be moved to the new facility unless the shelter’s medical director determines an animal must be euthanized due to a medical condition. [A]ll animals housed at the facility on Tchulahoma during that time will be transferred to Appling City Cove unless the Medical Director determines that the animal has a medical condition that would prevent its transfer. 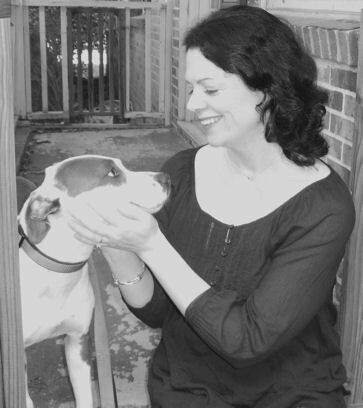 “MAS’ primary focus during this time of transition is the safety and well-being of the animals,” said Public Services and Neighborhoods Director Janet Hooks. On November 5, 4 cats were killed at MAS – 1 for behavior and 3 for space. 25 dogs were killed that day including 5 with no reason given. 3 dogs were killed for behavior, 1 was killed for being too young, 15 were killed for space and only 1 dog was killed for a medical reason. 2 Pitbulls fell over dead in their cages at MAS that day bringing the body count for November 5 to 31. On November 10, 2 cats and 1 dog were killed for space, 5 dogs were killed for behavior and 4 dogs were killed for medical. November 15 was the first day the new facility was open. That day, 2 cats and 8 dogs were killed with no reason given. 12 more dogs were killed for space and 1 dog was killed for medical. The following day, November 16, 4 dogs are listed as “died”, 23 dogs and 1 cat were killed for space, 4 dogs and 1 cat were killed with no reason given, and 3 dogs were killed for medical. These statistics do not seem to jive with the city’s public reassurances that all animals would be transferred unless a medical condition prevented it. Further, I do not understand how could space possibly be a reason for killing when the shelter was in transition or when it was first opened at the larger facility. Remember that MAS refused to allow the public to foster dogs from the stray area during the transition period. How can they deny help from volunteers willing to save pets’ lives and then turn around and kill the pets for “space”? Are these killings the result of the city’s focus being directed toward the “safety and well-being of the animals”? I dread to think. The MAS fail boat sailed long ago. The only question now is how much longer until the caring people of Memphis wage a political campaign for reform against the city. I hope it won’t be much longer. 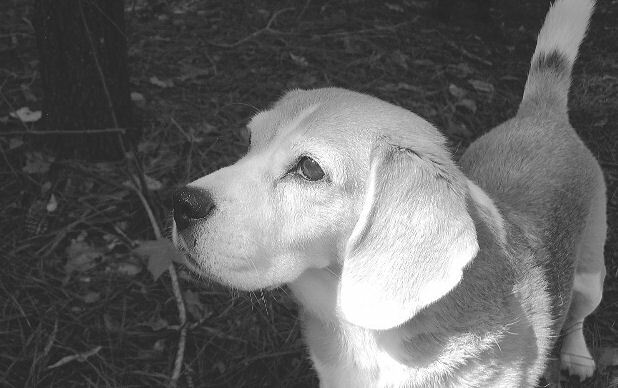 Thanks to everyone who sent suggestions and offered assistance in getting the Beagle mama from TN to SC. We have a plan in the works which should get her to Spartanburg in installments over the next couple of weeks. I will drive there to pick her up. I will post if there are any changes to the plan or if I need to pick your brains again. This has been a learning experience for me. I was trying to explain the challenges to Billy (while dodging the frying pan) and I likened it to government red tape. Restrictions have been put into place by many rescue transporters (paid and volunteer) in order to protect pets. This is good. But as a result of the restrictions, transporting to an actual adopter (and not a rescue organization) is specifically excluded. This is not so good. I don’t know what the system-wide solution is – if there is one – but it would seem like evaluating transport requests on a case by case basis might lead to more shelter pets saved. Thanks again and hopefully the next time I’ll be posting about the bagel is to say she is home. A small group of caring volunteers in Middlesex, New Jersey has been maintaining a colony of cats in the community for 8 years. The colony lives in a field behind a church. The volunteers bought and set up a shed for housing the cats, trapped them all, had them vaccinated and neutered, and returned them. They now feed them regularly. Over the years, the colony has reduced in size due to adoptions and deaths from 24 cats to just 10 today. “For eight years, it has been an extreme health risk,” Middlesex Mayor Robert Sherr said, drawing groans from those who last week attended an emergency meeting of the borough’s board of health. It’s been an EXTREME HEALTH RISK for 8 years! Gah! Think of the children! But health officials say the cat community is unsafe, particularly with a preschool operating in the rear potion [sic] of the church. “If I was the parent of a child at the preschool, I would be upset,” [Borough board of health president John] Madden said. Yes, just imagine. Your wee tot might see a cat from a distance. And of course, seeing a cat is a good way to get RABIES! “Managed cat colonies are not a humane solution for the cats because they still face a multitude of hazards, including cars, poisoning, animal attacks, inclement weather and human abuse,” acting county health director Katherine Antonitis said in a statement. She said rabies infections are more prevalent in cats than dogs. As to how many kiddies have been infected by rabies from these elderly cats over the past 8 years – well, I guess it must not be too many or they would have mentioned it. Church staff have reportedly had to cover the kids’ sandbox, which I’m sure is a terribly exhausting ordeal to suffer through each day, but isn’t that just good practice for any pre-school? I know it’s a code red extreme health risk situation here with the grumpy old cats but has anyone checked to see how many kids at the pre-school have actually gotten sick from the cats vs. how many have gotten sick from getting coughed on, sharing toys, and eating food off the floor? Maybe the borough should convene another emergency meeting. By the way, does every man, woman and child have access to health care in Middlesex, NJ? Cause if not, I wonder if the board of health might have any more pressing items on its agenda. A good Samaritan in Harrisonburg, VA picked up an injured cat on the road on November 11 and took him home, contacting authorities. A police officer responded to the call and told the good Sam he had two choices – let the cat suffer and die or let the officer kill the cat. Unless this officer is also a veterinarian who travels with diagnostic testing equipment, I don’t know how he determined that the cat was medically hopeless but that’s what reportedly was said. I doubt the officer had a microchip scanner either to see if the owner had permanently identified the cat in case of emergency. But I guess, you know – meh. Instead, he looked out the window and saw the officer drawing his baton. He said he went to the kitchen so he wouldn’t see what was about to happen. He estimated that the officer struck the cat 15 to 20 times. By the time the brutal killing was over with, the good Sam had tears in his eyes. He looked outside to see blood everywhere and damage to the siding on his home. I assume the baton wielding was so violent that the officer could not control the weapon and caused damage to the siding. The good Sam was so upset, he could not stay in his home that night. I’m not trying to be morbid here but just close your eyes for a minute and picture an injured cat in need of help. Then count to 20. It’s unbearable. I can not fathom the level of barbarism required to commit such an atrocity, let alone get my head around the notion that we are talking about a police officer, sworn to protect and to serve the community. This cat may have had an owner but the officer apparently didn’t bother to check. If the cat had no owner or his owner was unknown at the time of the call, he was a community pet. Serve. Protect. The officer has not been named and the department will not say whether he was disciplined. The blog has been sort of a dead zone (typical for holidays) since Thanksgiving. So while some readers are away stuffing their faces with the last of the pumpkin pie leftovers, I thought the rest of us could play Name That Animal. I saw this animal on TV for the first time today. No researching, just have a guess. I’ll post the answer in the comments later today.